The word ‘rehab’ may carry heavy, publicly stigmatized connotations, and getting involved in one may be a jab at your pride and ego. However, rehab is an absolute necessity for a safe, healthy, and successful recovery to take place. Addiction to drugs and alcohol is not something you can conquer and overcome on your own. Going “cold turkey” is a big no-no, as it is always dangerous and in some cases (such as in alcohol withdrawal) even fatal. Public embarrassment and shame cannot bring sobriety or restore health, but your willpower and rehab for men can. 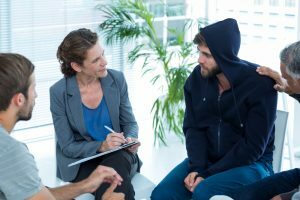 For actual recovery to begin, the most critical step is for a patient to acknowledge his real and actual need for external help and support from loved ones, as well as from professional drug addiction treatment providers. Getting past the denial stage is not something you have to accomplish alone. Our mental healthcare experts can assist you in overcoming this phase and making healthier decisions. They will educate you on the cold, hard facts and consequences of substance abuse. By opening your eyes to the reality of your addiction, you are opening the door to recovery and sobriety. His House treatment center’s rehabilitation program makes use of a comprehensive approach to restoring our patients’ overall health and wellbeing. We understand the significance of support from family and friends in the recovery process. We recognize your need to rebuild relationships and restore social function and productivity after a successful recovery. We also acknowledge relapses as a normal part of a recovering patient’s journey. Thus, as much as possible, we provide programs to equip our patients with the necessary knowledge and skill set to help keep relapses at bay. Addiction is a many-headed beast. It is a disease with many other co-occurring conditions, whether physical, medical, psychological, or behavioral in nature. Recognizing and acknowledging this, we provide a comprehensive treatment program that is unique to each patient’s needs and tailored to certain disabilities or mental health issues. Our exclusive rehab program for male patients could help in addressing their distinct and multifaceted needs. We provide a safe process of overcoming denial, admitting the need for help, and successfully recovering from addiction, so that they can restore their true potential as husbands, fathers, and sons. The puberty stage is when curiosity, peer pressure, and experimentation are at their peaks. During this time, young adults often try alcohol and drugs without fully understanding the consequences. If your child happens to be caught in the tight grasp of drugs, let us help redirect him to the path of sobriety for a fuller life and a brighter future ahead. Outpatient treatment isn’t for everyone. Most cases call for inpatient treatment. If our healthcare experts recommend that your loved one should stay in our residential rehab facilities, it’s nothing you should worry about. Our programs are categorized into age-specific and gender-specific groups for comfort, convenience, and recovery progress. If you’re worried about rehabilitation possibly disrupting your daily routines, enroll in our Partial Hospitalization Program (PHP). You have the option of living at our residential facilities on and off as required for treatment, commuting to treatment daily, or staying at home all throughout, all for your convenience. If you or a loved one is suffering from self-harm, depression, eating disorders, or drug dependence not requiring detoxification, our Intensive Outpatient Program (IOP) will be of great help. Treatment and recovery are made possible even in the comfort of your own home. People often misuse the term ‘abuse’ for ‘addiction’, and vice versa. Often interchanged, they have different but related meanings. Either way, if you have a drug problem, do consult us immediately. We could help in identifying which is which, and recommend the correct treatment. Addiction is considered by medical authorities as a brain disease. The National Institute on Drug Abuse (NIDA) states: “Addiction is defined as a chronic, relapsing brain disease that is characterized by compulsive drug seeking and use, despite harmful consequences.” Like other diseases, early diagnosis and treatment are imperative for recovery. Addiction is a disease that will consume you physically, mentally, and socially when left untreated. The good news is: chances of recovery are promising. By adapting the 12 Steps and 12 Traditions of Narcotics Anonymous, you can stay clean and lead a fuller life.